​ Do you think girls are complicated? How about programming? Some people say, "If girls are complicated and so is programming, then why aren’t more girls in STEM (science,technology,engineering,math)?" Have you ever noticed when you go to the doctor, the receptionist is mostly always a women? Hasn’t that ever bothered you? How about the nurses and doctors? Some still believe that nurses should be women and doctors should be men. C’mon people, we’re not in ancient times, this is the 21st century! 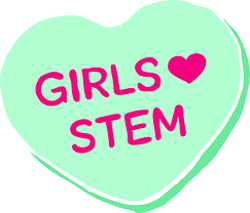 Girls can do anything and everything, ESPECIALLY S.T.E.M. Women have endured and sacrificed on this Earth just like men have. In fact, we almost had a woman president this past election year. We believe in GENDER EQUITY - meaning access to higher education and careers in S.T.E.M, regardless of race, creed, color, religion, orientation or GENDER. ​Ada Lovelace was the first computer programmer ever. She was an English mathematician and writer. Her full name was Augusta Ada King-Noel, Countess of Loveless. She was born on December 10, 1815 and died November 27, 1852. Grace Hopper was one of the first programmers of the Harvard Mark 1 computer in 1944. She was an American computer scientist and United States Army Rear Admiral. Her nickname was Amazing Grace. She was born on December 9, 1906 and died January 1, 1992. She was one of those who popularized the idea of machine-independent programming languages which led to the development of COBOL, one of the first high-level programming languages. ​She was born in 1867. In 1891, Marie moved Paris. In 1903, Marie Curie became the first woman to receive the Nobel Prize in physics. Curie received another great honor in 1911, in chemistry, for her discovery of radium and polonium. On July 4, 1934, Marie Curie died of aplastic anemia, which can be caused by prolonged exposure to radiation. We got help from Team 597! Check them out! Team 597 is a high school robotics team from Foshay Learning Center! Their mission is to motivate young men and women through robotics to pursue their interest in STEM! Create video games, learn coding, and much more!